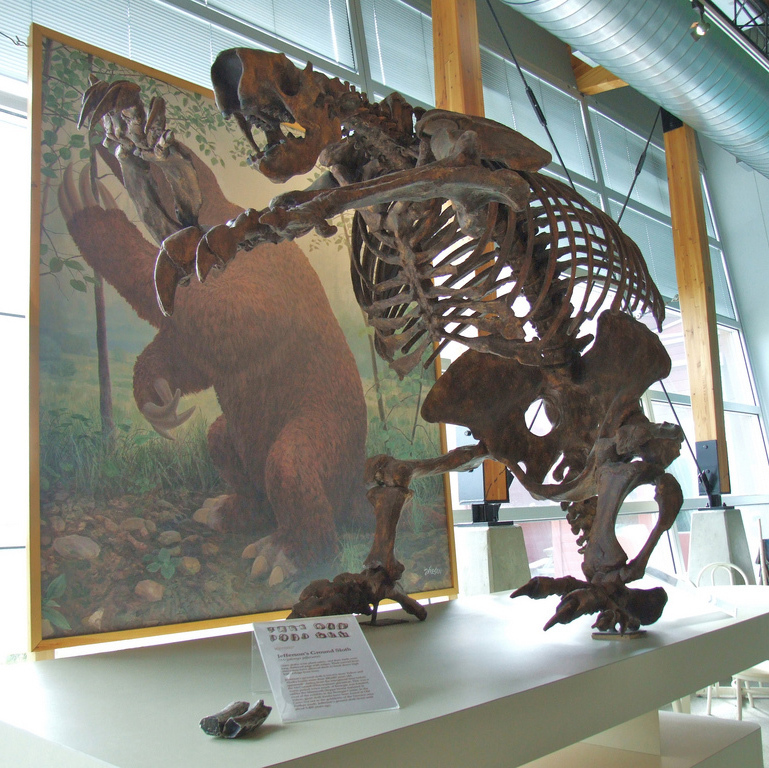 Jefferson's ground sloth; Megalonyx jeffersonii; the official state fossil of West Virginia. Photo by Travis/Flickr (Noncommercial Use Permitted with Attribution). President Thomas Jefferson obtained and described fossil bones from a limestone cave in what is now Monroe County in 1797, giving them the genus name "Megalonyx" ("great claw"). These bones were again described by Casper Wistar in 1799 as the bones of a giant extinct ground sloth and were named in honor of President Jefferson. Megalonyx jeffersonii lived during the Ice Age, or Pleistocene Epoch, which lasted from 10,000 to 1.8 million years ago. This extinct ground sloth grew 8 to 10 feet long and weighed up to 800 pounds. RESOLVED by the Legislature of West Virginia:That Megalonyx Jeffersonii be designated as the official state fossil; and, be itFurther Resolved, That the Clerk of the Senate is hereby directed to forward copies of this resolution to the schools in the state. 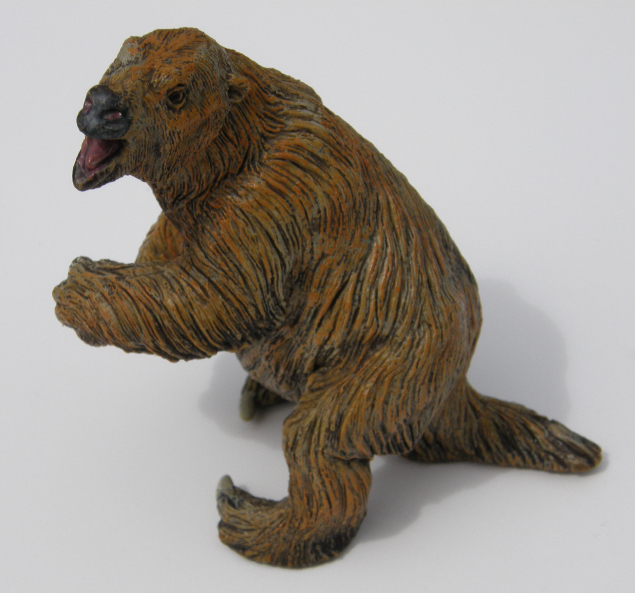 Model of giant prehistoric sloth Megalonyx jeffersonii; photo by Jim Brace-Thompson / American Federation of Mineralogical Societies (used by permission). 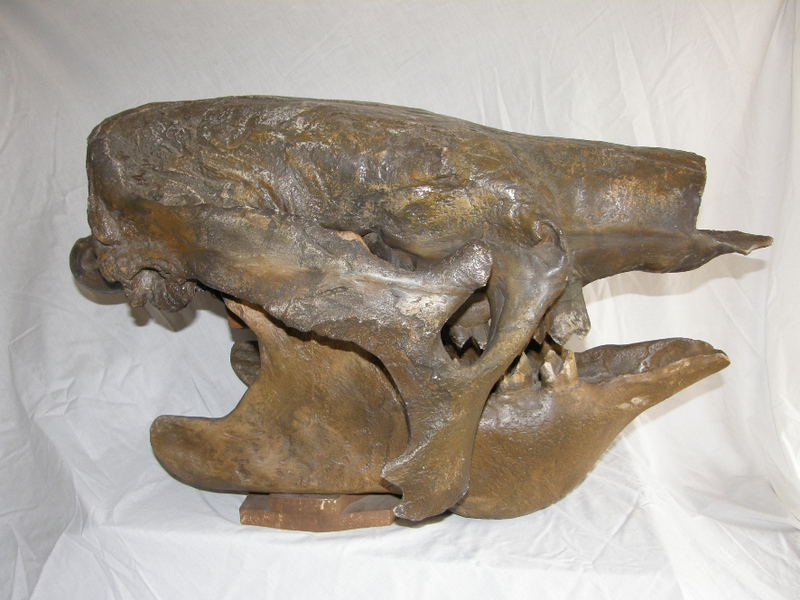 Skull cast of prehistoric ground sloth fossil; photo by Jim Brace-Thompson / American Federation of Mineralogical Societies (used by permission). Megalonyx jeffersonii (Edentata: Jefferson's giant ground sloth); photo by S. Fitzpatrick on Flickr (noncommercial use permitted with attribution / no derivative works).